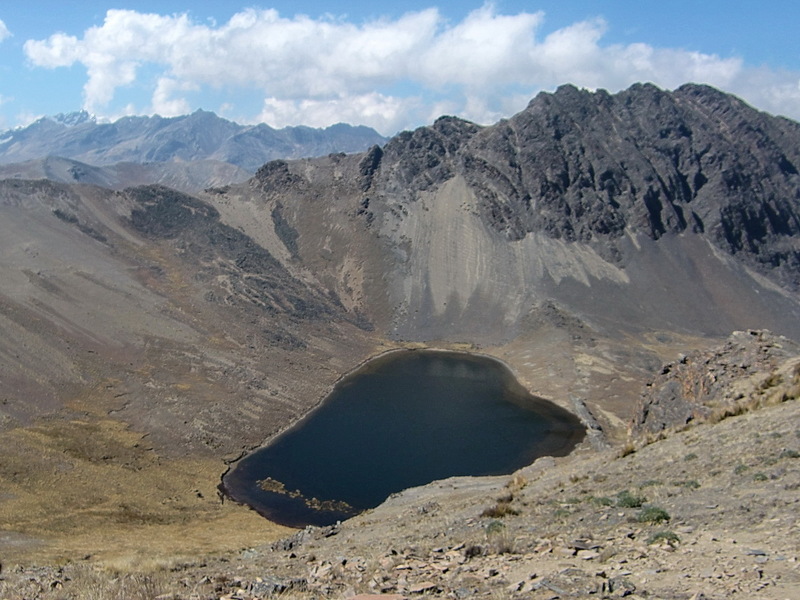 The Cordillera Real is the mightiest mountain range in Bolivia with several peaks above 6000 meter. 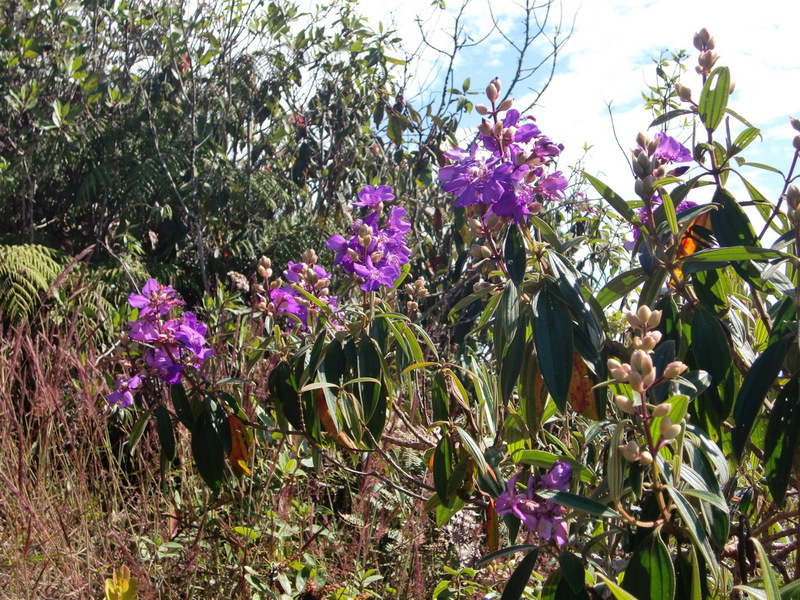 It is situated on the east side of the Altiplano and it gets in summer a lot of precipitation from the Amazon area. Thus the glaciations are heavy for this latitude; the permanent snow line starts at 5200 meter. 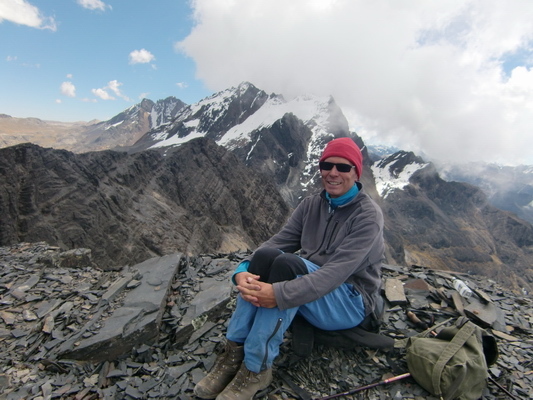 We climbed in June 2011 Cerro Saturno (5006 meter seal level), Serranias Almillanis (5108 meter) and Cerro Charkini (5392 meter). 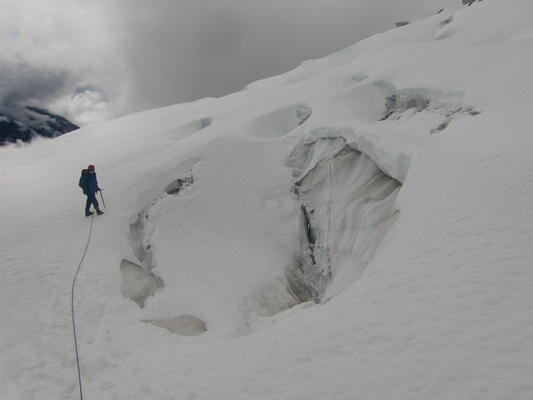 To achieve the summit of the latter one we had to cross a glacier with huge crevasses. The Yungas are the lower slopes down to the Amazon basin. 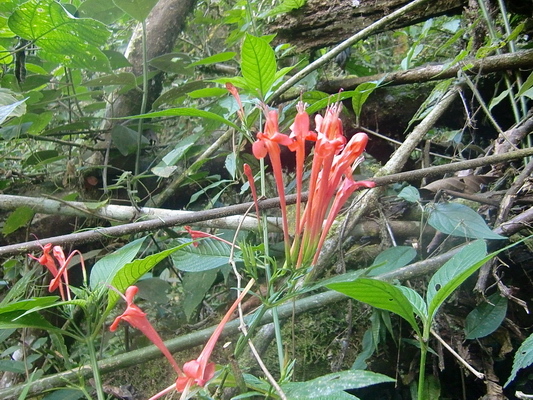 They have a rich flora and fauna, thanks to the clouds and rain coming from the Amazonas. 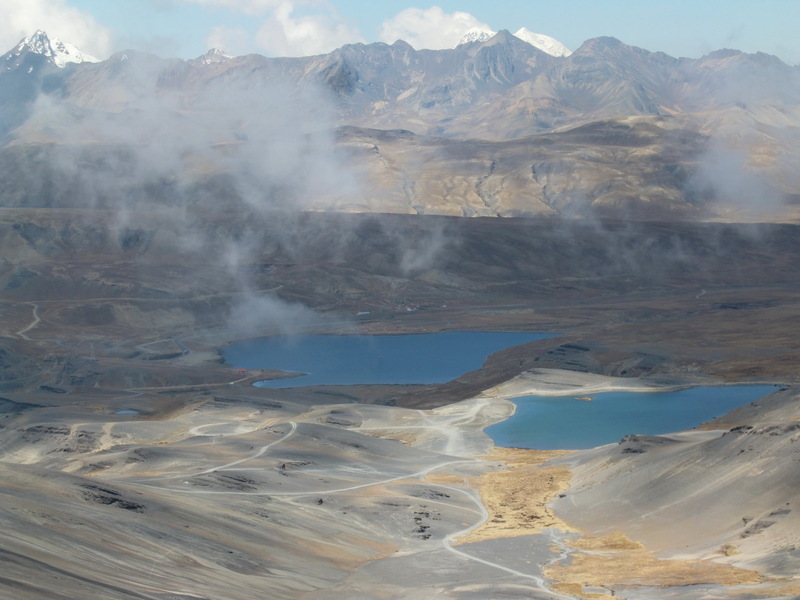 A nice tourist destination is the village Coroico, which is accessible now from La Paz by a fully tarred road. But you have to cross the 4650 meter high pass Cumbre Coroico or La Cumbre. 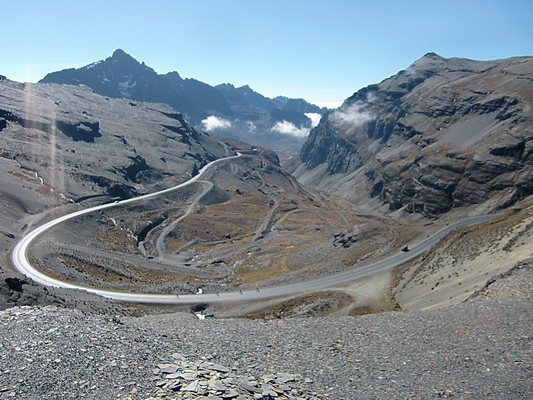 Few years ago the descent from this pass was horrible due to a narrow and dirty lane in vertical rocky walls. Many people died in the huge traffic and there are a lot of memorials. This old street is called the Camino de la Muerte, the Death Street. Now it is an outstanding mountain bike tour. 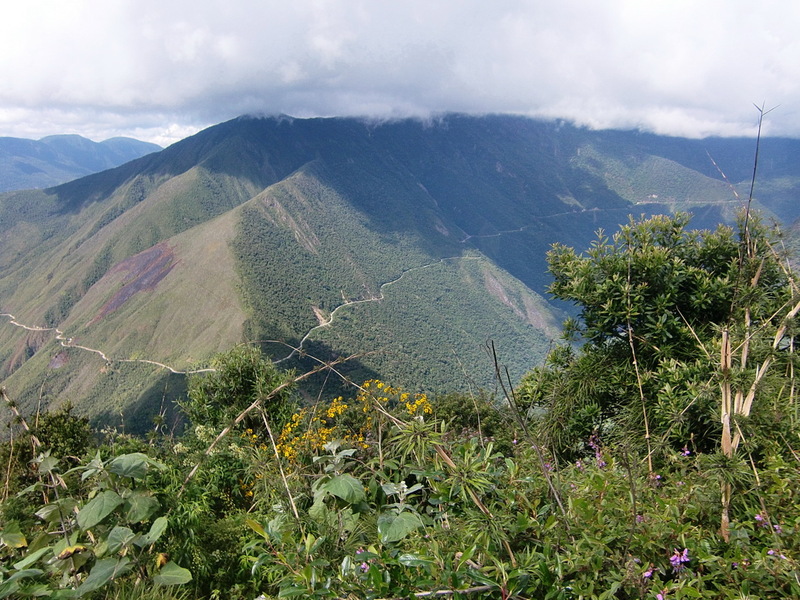 If you start at La Cumbre, you have a vertical downhill distance of more than 3400 meters. Cerro Saturno is one of the most accessible 5000er of our world. We started directly at the camp of the park rangers close to the pass La Cumbre, where we also stayed the night (GPS coordinates: S16° 19.321' W68° 03.256'). We followed the viaduct half an hour and gained over flat slopes the pass Abre Chukara. 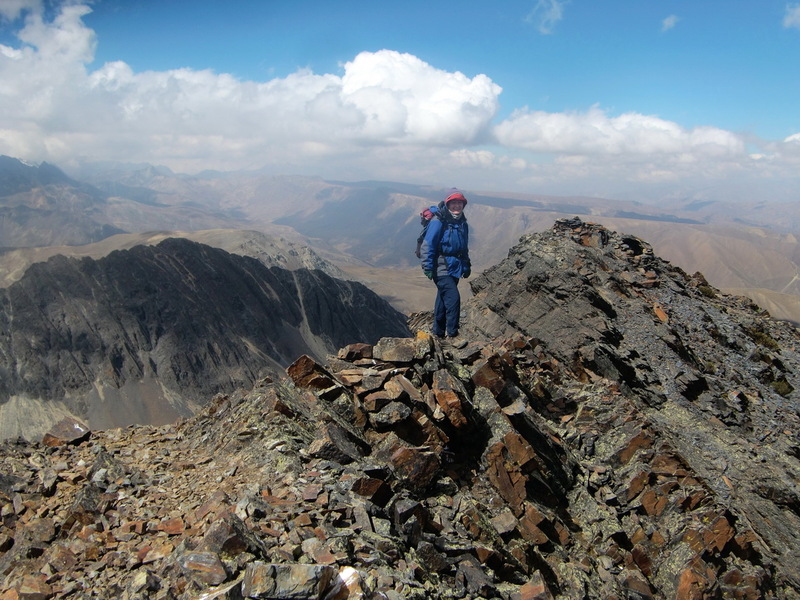 Now we followed the ridge in northwest direction and achieved the main summit of the Cerro Saturno (GPS coordinates: S16 19.034 W68 03.815) after another hour from the pass. 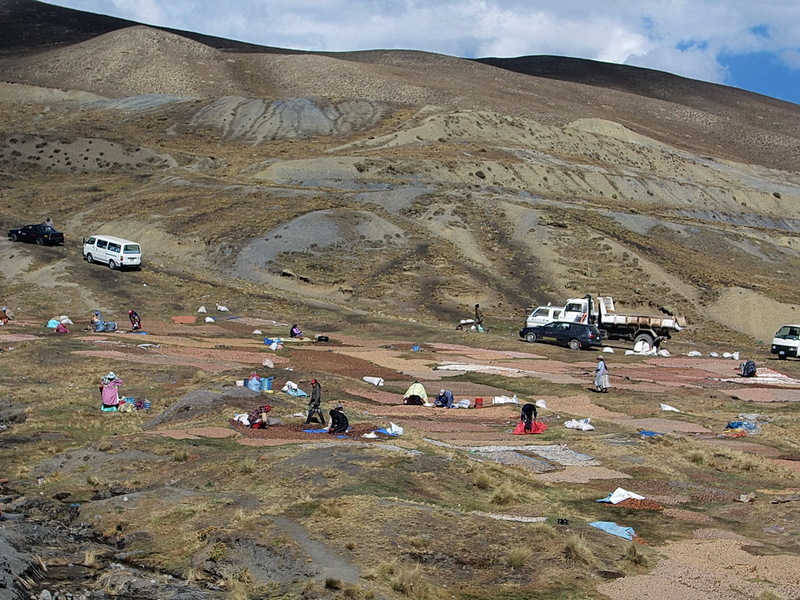 There were many people on the pass La Cumbre to dry potatoes in the sun. We came back to our car at lunch time and Alfred decided to drive with his bicycle from the pass La Cumbre down to the village Yolosa, which is only 1200 meter high. But first two Rangers visited us in our car. We served them Coca Cola and tangerines, and we had a lot of fun and exercised our Spanish language skills. The first part of the bicycle tour was pure pleasure: Heading approximately 30 km down on a tarred road. The steepness was perfect: Neither the brakes nor the pedals were used often. Then a long flat part came with some ascents. This was a little bit annoying, because it was already late afternoon and Alfred wanted to avoid the darkness. 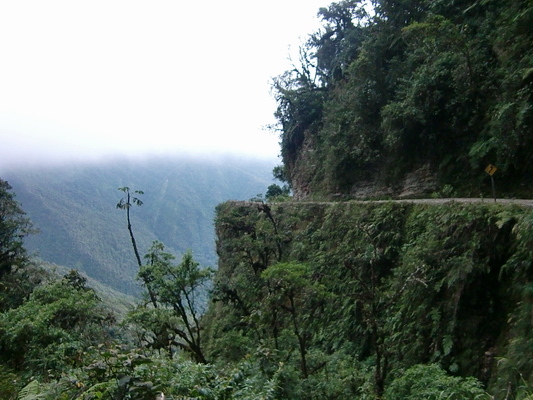 Finally the Camino de la Muerte came: A rough dirty road from 3200 to 1200 meter sea level with more than 30km length. Fortunately Alfred's mountain bike had a very good suspension on both wheels. And several time a bus or truck came, which filled the whole street. This part was less comfortable than the first one, but the landscape was overwhelming. It became more and more green. It was already relatively dark, when Alfred arrived in the little village Yolosa. Luckily Marion came soon with our VW California. There was a nice and quiet campsite few kilometers up the Camino de la Muerte close to two waterfalls. 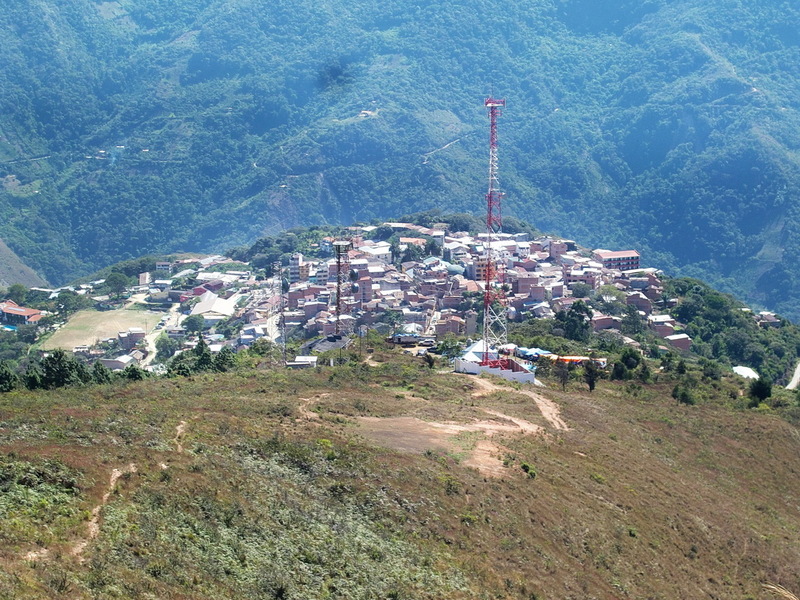 Coroico is a pleasant town with all facilities and genial climate situated on the ridge of the Cerro Uchamachi at 1700 meter sea level. Alfred climbed from a chapel in Coroico (GPS coordinates: S16° 11.483' W67° 43.443') to the summit of 2480 meter high Cerro Uchamachi (GPS coordinates: S16° 12.644' W67° 42.800') which is a true jungle trip: Fortunately a good path leads through dense forest and rich meadows to the summit. But you have to be aware about snakes, especially in the trees. 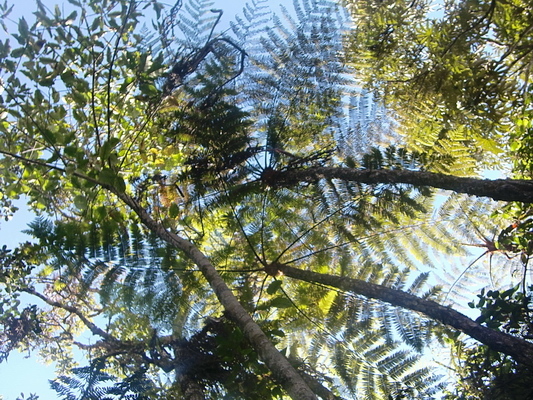 Another walk from Coroico is 2.5 hours to the waterfalls along a stunning aqueduct. Now these waterfalls are used for the supply of drinking water, so they are fenced and it is not possible to take a bath. 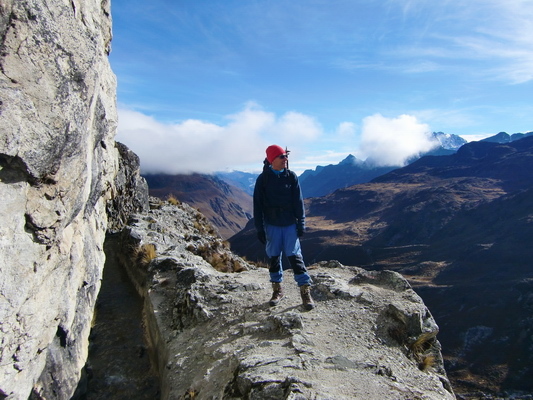 We returned to the pass La Cumbre after three days and climbed the rocky Serranias Almillanis (GPS coordinates of the summit: S16 23.527 W68 03.809) from the artificial lake Laguna Incachaca. It is the highest point of a sub range, sticking west. 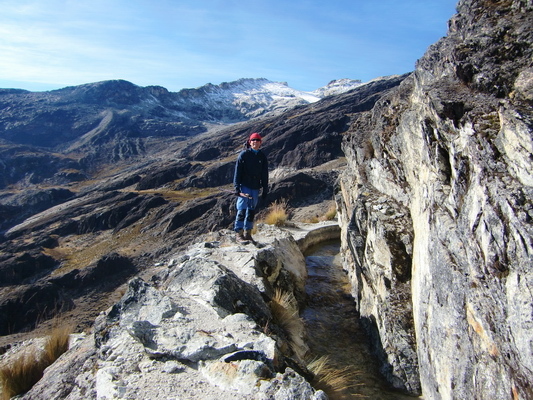 You have a wonderful view to the valleys of La Paz. Unfortunately it was very dusty this day, so we couldn't take good pictures from La Paz. 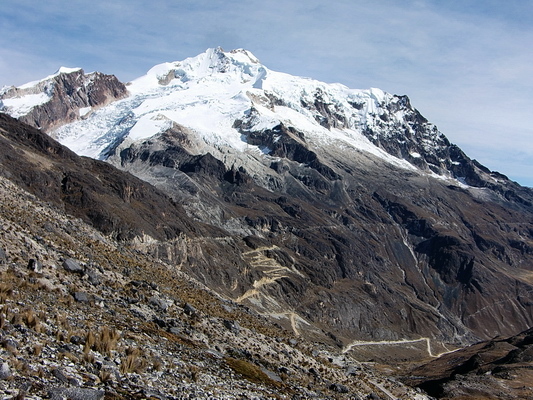 Our next destination was the Zongo Pass on foot of the famous mountain Huayna Potosi. We stayed the night in front of the security building for electricity. The people there were very friendly and helpful (GPS coordinates: S16° 16.912' W68° 07.313'). Of course this was a target for us, but we both still had some trouble with a severe cold. 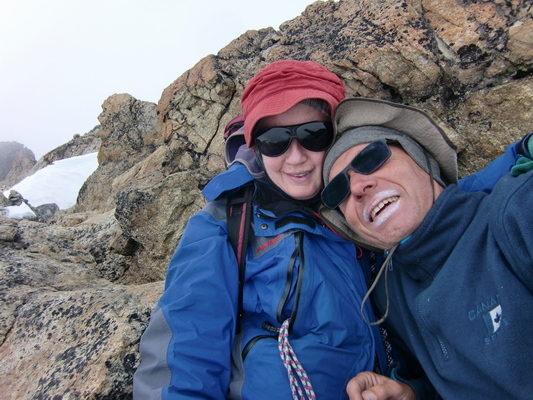 First we climbed Cerro Charkini, a fantastic trip opposite of Huayna Potosi. 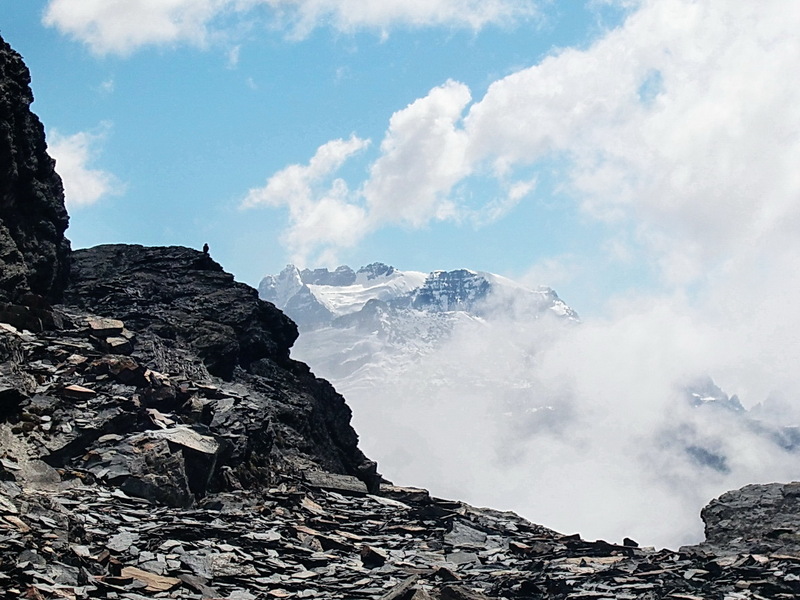 The Zongo Pass is already 4700 meter, so it is just 700 vertical meters to the 5392 meter high summit (GPS coordinates: S16 17.960 W68 06.072). But these 700 meters are very diverse: First we walked along a spectacular aqueduct through more than 100 meter high vertical walls. Sometimes the path near the aqueduct was very narrow, less than 30 cm - stumbling not allowed. After the aqueduct a pristine valley came followed by a glacier with huge crevasses to the saddle between the two peaks of Cerro Charkini. The last part was an easy scramble to the top. Unfortunately the weather became more and more cloudy and windy. When we came back to the aqueduct it started hauling. We walked back very, very carefully, because it became a little bit slippery. The weather on the next morning was very wet, the forecast everything but promising and we both coughed a lot. 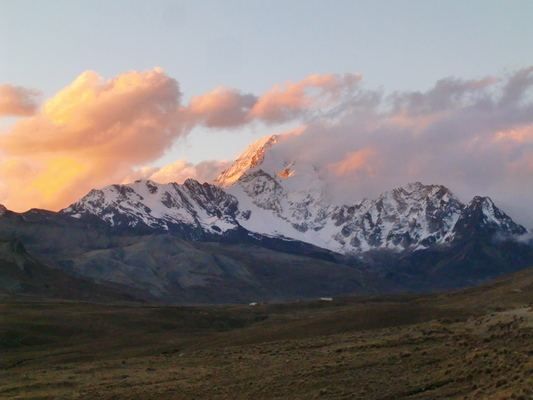 Thus we decided to skip Huayna Potosi this year and to return to the Hotel Oberland in La Paz. Besides that our car refused to start due to lack of oxygen, wetness and cold. Fortunately the people of the security pushed our car to a falling slope.